Frame: 3.25 Round Centerpost Anodized Aluminum with Stainless Steel Hardware. Durable high performance hub and fittings. Galvanized steel internal mast stem/powder coated base plate included. Telescoping Mast. Crank lift system with removable handle. 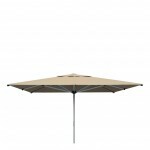 Canopy and Base Required, Sold Separately. 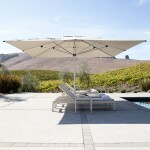 Pricing shown includes frame with JANUS et Cie Standard Fabric canopy. Please see your sales specialist for additional options and pricing.